Debuting in 1972, the band Van Halen quickly achieved worldwide success after the release of their 1st album entitled, 'Van Halen'. Eddie Van Halen's guitar picks are some of the most sought after picks for collectors. 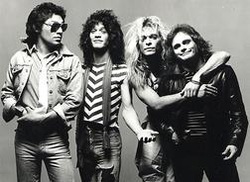 In 1983, the band earned a spot in the Guinness Book Of World Records for highest-paid single performance of a band after receiving 1.5 million dollars for playing a 90 minute set. In March of 2007, the band was inducted into the Rock & Roll Hall Of Fame.